OpenWorld There was not one but two demonstrations being held in San Francisco Wednesday; a real one carried out in support of Occupy Wall Street and a fake one outside the St Regis hotel staged by Salesforce.com. 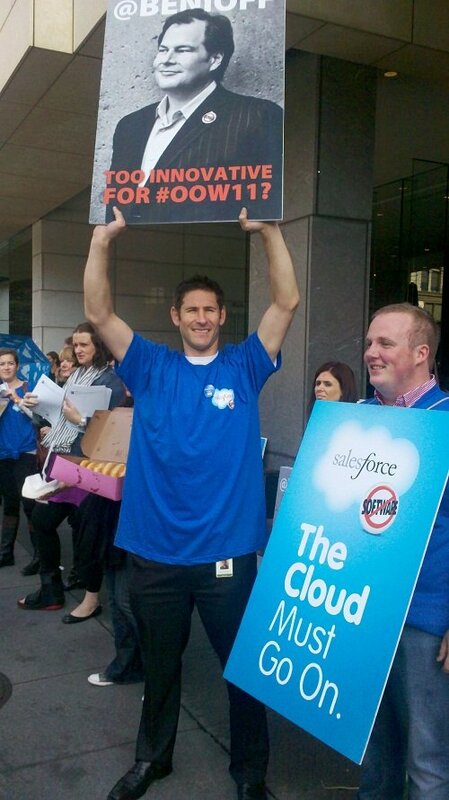 While the first demonstration is inspired by corporate greed, the second was sparked after Oracle refused Salesforce.com use of a theatre on site to give a keynote, giving the smaller company less than 24 hours to find a new venue. As a result CEO Marc Benioff gave his keynote in a cramped hotel restaurant, while staff chanted about freeing up the cloud outside, handed out free doughnuts, and held up pictures of their boss. Benioff blamed the cancellation on comments he posted on Facebook disparaging Larry Ellison’s keynote on Sunday, saying Oracle’s CEO has set a low bar for such speeches. He said that he regretted the posting and had apologized to Ellison, but at 3:30pm yesterday he got an email saying that Oracle was cancelling the company’s use of the Novellus Theatre, a space Salesforce.com had paid Oracle a million dollars to use. The end result was that the Salesforce.com presentation was one of the most keenly attended sessions at the show, with the line to get in extending around the hotel and many people disappointed that they got in. What was ironic was that the actual speech Benioff gave had very little in it that hadn’t been said at his company’s DreamForce conference six months ago. Benioff argued, as he has repeatedly, that enterprises needed to rework themselves to become social organizations, and should rebuild front end IT systems to monitor and track customers on social media. Salesforce.com wants its Chatter application to become the business version of Facebook, and the infrastructure could all be handled in the cloud without expensive hardware. Ellison understands this cloud model, Benioff said – after the Oracle boss he was one of the original investors in Salesforce.com and owns 75 per cent of NetSuite. But he was here at OpenWorld to sell hardware and software and Benioff’s message didn’t agree with that. The very power of social media had been demonstrated at the conference by Oracle, he pointed out. Getting the word out to delegates that the venue had changed wouldn’t have been possible two years ago, but thanks to Twitter and Facebook the team got a new venue for Saleforce.com and the event went ahead. Benioff neglected to point out that without his comments on a certain social media site he might still have his original venue. Nevertheless oracle has scored a major own-goal from a marketing perspective. The relatively content-free nature of Benioff’s keynote would have gone largely unnoticed but for the blacklisting decision, but is now the cause célèbre of the show. Benioff has described Ellison of a mentor and role model. The protege spent 13 years at Oracle, and was the company’s youngest vice president before leaving to set up Salesforce.com. While he criticized Oracle’s stance on hardware and software, Benioff did use the press conference after the keynote to apologize to Ellison for his earlier comments. However, it does look like the end of the road for Salesforce.com at the OpenWorld show.